Pinoylitics is Basically Aliens vs. Predator! If one has heard of the Aliens vs. Predators movie, it was basically a race of two lethal extraterrestrial races namely the Predators vs. the Xenomorphs. Both are basically a threat to Earth. I mean it's a bad guy vs. bad guy scenario. And that's what is wrong with Pinoylitics... regardless who wins the Philippines is destined to lose anyway! One may want to remember the 2010 elections. President Nobita (right) vs. Erap. Erap was even allowed to run again IN SPITE of the jueteng scandals that really deserved him to be impeached. And why was he allowed to run? Simple pinoylitics is about WINNABILITY NOT CREDIBILITY. What voters ignore is that the Ninoy Aquino of the PHP 500.00 bill is NOT his son President Nobita. And one may also think about the Aliens vs. Predator situation that was also Macoy vs. Cory. Neither Macoy nor Cory really left the economy in good hands when both terms ended. It's always money grubbers vs. morons- whoever wins the Philippines is always at a loss! 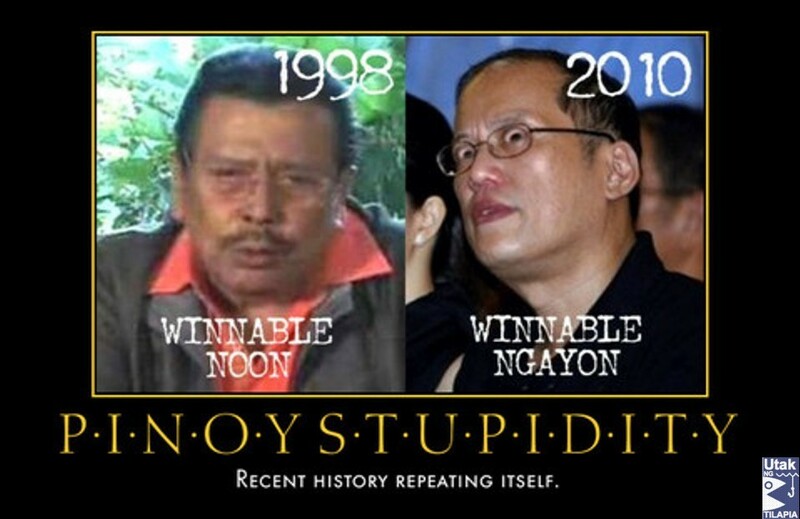 In the case of Erap vs. Nobita, it was moron vs. moron! Another worth thinking back about is the late FPJ vs. Gloria Abobo. Da King vs. the little tyrant who is now Nobita's scapegoat. 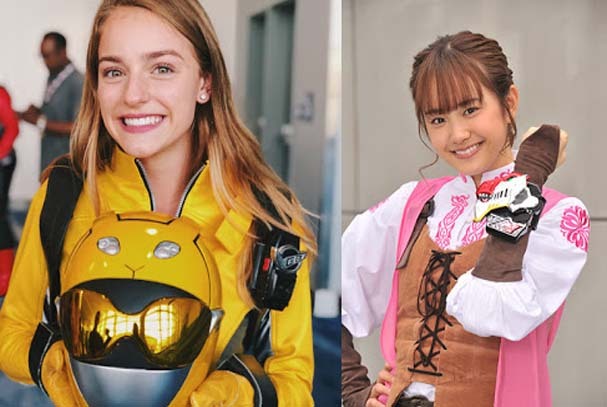 In due fairness, the little tyrant is more favorable over FPJ but at the same time, she had also gotten connections back from her father's regime. Should I mention that Gloria Abobo was also involved with the ZTE broadband scandal? 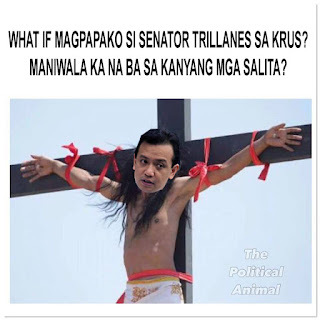 And what if FPJ won? Da King would not help the Philippines either! Da King is not a good model in not pursuing to even finish high school. I mean the security guards can't even get their jobs without a high school diploma and then the Philippines nearly had a president who hasn't reached a high school diploma? One may now consider again WINNABILITY. Doraemar Roxas lost the VP but may run for president. VP Jejemon Binay in spite of his corruption charges may run for President. And who else will run? Maybe Bongbong Macoy? And now Ramon Reviler will run? Oh yeah the problems are simple from a Doraemon type president to another strain with international affairs president, let Bongbong win and he will declare martial law in his first day in office and bury his father Ferdinand Macoy at the Libingan ng Mga Bayani (which Macoy is NO HERO either) or well Ramon Reviler will probably clog the arteries of the Philippine economy with more pork. And what if Unngoy Estrada wins? Again, he will continue the Erap dynasty of pork which all Filipinos lose either. Isn't it any wonder why the Philippines shares the same problems with third world politics? After all, the Gandhis did ruin India with their political dynasty. And now what's next? Please think!